Perhaps every person on Earth has at least once been in a situation when he or she has an urgent task to do, but instead of challenging it head on, he or she postpones working on this task for as long as possible. This delay can take various forms: from doing nothing, to doing a lot of work–just not the work that should be done. The phenomenon described here is called procrastination, and its roots go much deeper than mere laziness. Usually, people tend to see procrastination as something bad. They invent dozens of strategies how to stop procrastinating and increase their efficiency, forgetting about the fact that like many other psychological mechanisms, procrastination serves its own purpose, and probably even carries a message worth decrypting. So, instead of blaming yourself for being lazy, the next time you procrastinate, try to look past it, and figure out what is happening to you. Most likely, procrastination is your friend. Why? There are several arguments proving this thesis. First of all, it helps you figure out your most pressing priorities. Usually, you will not procrastinate over some minor task such as sharpening a pencil or drinking a glass of water. Problems start when there is something important or difficult that needs to be done. Reasons withholding you from doing work can be different, but here is a clue to remember: try to figure out what exactly makes you shirk–as a rule, it should be exactly what is your top priority task at the moment (Psychology Today). A pressing matter, an urgent document that needs to be written by the end of the day, an especially difficult piece of work, whatever. On the other hand, procrastination may serve you as an indicator that you are doing something wrong, or that you are pushing yourself too hard and need to take some time to rest. Either way, the means you use to overcome procrastination is a different story; so far, try seeing procrastination as a marker, an index–and you will discover that it can be quite useful. For many people, the decision-making process is a troubling one. This varies depending on the weight of a decision that needs to be made. Making up one’s mind to marry another person may take months, whereas choosing between orange and pineapple juice is usually a piece-of-cake decision (surprisingly, there are people for whom this is the opposite). And, as a general rule, when they have to make an important decision, people tend to procrastinate. Although we often scold ourselves for indecisiveness–and sometimes our friends and relatives may press us as well–in fact, procrastinating in this case is also beneficial. According to Frank Partnoy, the author of the book Wait: The Art and Science of Delay, in this case procrastination is a signal for you to slow down. During this break, you are supposed take your time to weigh all possible options, gather more information, and make a decision based on the knowledge you obtain (Bustle). Surprisingly enough, procrastination can even help you fix a relationship with another person. If you had a fight, for example, there is a period of time when whatever you say to each other will most likely be perceived with skepticism or even hostility. Besides, you might have noticed how unwilling you may be when having to apologize in front of a different person–even if it was you who was wrong. In this case, procrastination may give you enough time to make up your mind, find your courage, and think of the proper words (or actions) for an apology. The same works for another person: after a cooldown period, he or she will be more susceptible to what you have to say (Psychology Today). Use this to your advantage. As we can see, procrastination is not necessarily a bad thing. Unlike many people got used to believing, procrastination is not a negative trait of character such as laziness, but rather a psychological mechanism, the main function of which is to slow you down and give you enough time to sort out your priorities, gather information before making an important decision, or finding proper words to make your amends with another person. Thus, instead of avoiding and denying procrastination, you might want to embrace it–at least sometimes. “6 Reasons Why Procrastination Can Be Good For You.” Psychology Today, Sussex Publishers, www.psychologytoday.com/us/blog/the-path-passionate-happiness/201511/6-reasons-why-procrastination-can-be-good-you. Florentine, Erica. “How Procrastination Can Be A Good Thing.” Bustle, Bustle, 25 Apr. 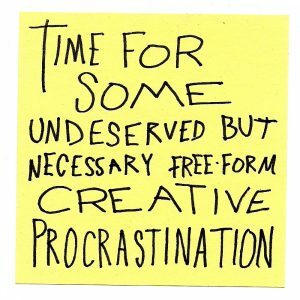 2018, www.bustle.com/articles/172114-11-times-procrastination-can-actually-be-a-good-thing.